I like to think of American football as a good example. Perhaps the most interesting relationship on the field is that between the quarterback and his wide receivers. The quarterback’s main job is to read the defense and figure out how best to make progress. The wide receivers’ job is to read the defense and figure out how best to get open so the quarterback can throw the ball to them . The most interesting part of this process is that the quarterback must actually throw the ball before the receiver arrives at the reception location. Because it takes a couple of seconds for the ball to get there, waiting until the receiver is wide open means waiting an extra couple of seconds during which the defense can get in the way. That’s why it’s important that the quarterback and the wide receivers see the same thing on defense and react the same way. When a defensive player behaves a certain way, both the quarterback and the wide receiver must realize it and react in complementary ways. That’s the only way a pass will work. It’s the same thing with a team of developers. You want everyone reading the field the same way. The fewer unique patterns there are in the code base, the easier it is for everyone to work with. As I’ve said in many of my writings and talks, code is actually a communication medium between developers. Making sure everyone speaks the same dialect is important. The very first talk that I gave was on maintainability. I wasn’t trying to trail blaze nor was I trying to prevent anyone from doing anything they wanted to do. What I did then, and what I continue to do now, is to share my experiences. When I say to avoid something, it’s because I actually ran into trouble using it. When I say something is a good way to approach a problem, it’s because I found it to be successful in my own work. Most of my advice has to do with building large web applications and working on large teams because that’s how I’ve spent the past several years of my career. If you have ever seen me give a talk in person, you probably heard me say that some of these don’t apply when it’s just you working on a project all by yourself or with a couple of other people. Because I enjoy working on large projects and with large numbers of people, I focus most of my own energy on making those systems work. I love the scalability problem because it is much more difficult than anything else. I never talk from a theoretical background and I never claim that my way is the only way to do things. everything I share publicly, from my blog posts, to my books, to my talks, is just about sharing what I’ve learned in the hope that it also helps you. If it doesn’t help you, I wholeheartedly invite you to leave my advice off to the side where it doesn’t get in the way. I have no desire to convince you that I’m right or that you’re wrong, my only desire is to share what I’ve learned and let you use that however you see fit. Both Angus and James base their arguments around the assumption that those who are recommending certain practices believe that everyone else is stupid. While I can’t speak for everyone, I don’t think that this is the case. Recommending certain practices has nothing to do with whether or not you think that developers are stupid. If that were true, you could say the same thing about every person who gave a talk or wrote a book recommending anything. I don’t know when people started getting so upset about recommendations, but pointing the finger back at those making the recommendations and saying, “don’t call me stupid,” is ridiculous. Unfortunately, this seems to happen whenever somebody disagrees with a recommendation. Think about driving. Most roads have a line down the center and some have guardrails along the side. Most of the time, you expect people to drive on the correct side of the road and not drive off of the road onto the sidewalk. Why bother having those lines and guardrails? I’m relatively sure that everyone within a country knows which side of the road to drive on and that staying within your defined driving lane is expected. The lines and guardrails just serve to reinforce what you already know when you’re driving a car. They give you a few extra hints. So if you start to veer over the line in the middle of the road, you know that you may be entering into some dangerous territory. The line doesn’t stop you from doing it, it’s just an indicator of expectations. Yet I don’t know anyone who is offended by the lines in the road or guardrails. And just like with best practices, sometimes you actually have to cross over the line or drive over a sidewalk. What if you’re making a turn to the other side of the street? What if you need to pull into a driveway? What if a car is broken down and you need to get around it? There are even exceptions to the rules of the road. No one really thinks about it because we all just do it naturally. Unfortunately both miss the context of this quote before dismissing it as bad advice. This quote doesn’t speak about your current teammates nor does it imply the person who is going to maintain your code will be stupider than you. The meaning behind this quote is that you don’t know who is going to be maintaining your code in the future and that person will lack context to figure out what your code is doing. Lacking context has nothing to do with intelligence. Think back to a time when you had to take over code from somebody else. Maybe that person was still at the company or maybe not. How did you feel needing to work with that code? I can tell you from personal experience, I’ve inherited some really bad code over the years. Code that is hard to work with because it’s very difficult to understand what it’s doing. I consider myself to be reasonably intelligent, typically above average on most days, but if you sit me down in front of some code that I’ve never seen before and tell me to fix a problem it will likely take me a while to do that. Always code as if the person who ends up maintaining your code will not be able to talk to you for help. If your code can’t be easily maintained by someone else, then that’s not a mark of quality. The teams I’ve worked on have all converged on common conventions and that has allowed anyone to be able to work with any file at any point in time. Understanding the conventions means that you understand the files and that means you can do your job with a very low barrier to entry. 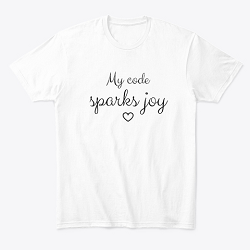 It’s a point of pride for my teams that code ends up looking the same regardless of who wrote it because ultimately it’s the team’s responsibility for that code rather than an individual’s responsibility. Thankfully, Angus ends his presentation with a very important statement: there are no absolutes. All of the rules and best practices that you hear about are simply a starting point. I always tell people on my teams that we’re going to define some rules and follow them until they don’t make sense. When they don’t make sense, we’re going to talk about why that is and figure out what we’ve learned. The rules are there to help you get off on the right foot and make sure that you don’t need to stop and ask at every moment what the right approach is. That’s important because our jobs are fundamentally repetitive. We go into work mostly doing the same thing every day. If your job is to create features on a product, you’ll find that the features can get implemented in very similar ways even though the features themselves are very different. If your job is to fix bugs, you tend to debug and fix things in the same way. It’s the same for all of us, programming is repetitive. If everyone ends up doing the same task in different ways than the code becomes harder to manage. So you start by defining some rules about how things will be written and deal with the exceptions as they come up. And there will be exceptions. Exceptions don’t mean that the rule is bad, it just means that the context has changed and the rule may not apply. What we’re really talking about here is skill acquisition. The rules are there to get you started on a journey of learning. All beginners are taught the rules that let them get moving quickly while avoiding common pitfalls. As you get more experienced, you learn more rules and also start to figure out the context in which the rules don’t apply. Not everyone is at the same level of professional development and so everyone doesn’t have a proper handle on what they’re doing to throw the rules away. It’s only through experience that these becomes more apparent, as the novice chess player eventually becomes a grandmaster.